Having read a lot of very interesting reports on using DVB-T and FUNcube Dongles I was keen to try out an SDR device of some description. My ultimate goal was to improve my EME setup with the introduction of Linrad and MAP65. 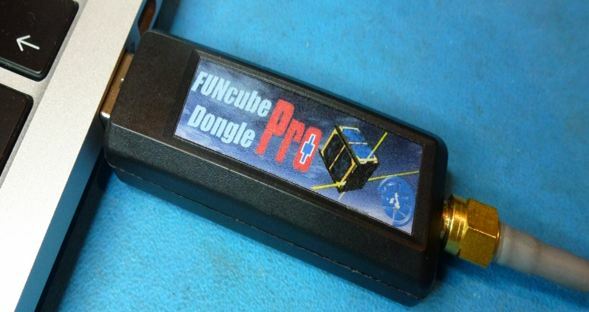 I spent sometime reading up on the Flex 1500 and FUNcube Dongle Pro and Pro+. The Flex-1500 had a certain appeal as the 5W or less transmit capability would be great fun on HF digi modes. Kristian (my son) 2E0KGG had recently purchased the Realtek DVB-T dongle and kindly left it with me to try while he was away in VP9. I ordered the FUNcube direct from Howard, placing the order on a Friday and it arrived at 08:10 on Tuesday morning, with excellent email communications confirming order and shipment status. The FUNcube was detected by Windows 7 without any problems and within minutes I was receiving on 80 and 40 metres with excellent results. The next thing was to plan how to integrate it into the existing system. Provide physical protection and filtering for the USB connection. The front-end protection is provided by an aerial change-over relay that switches the front-end to a 50 Ohm load on transmit. The switching being controlled by a sequencer. 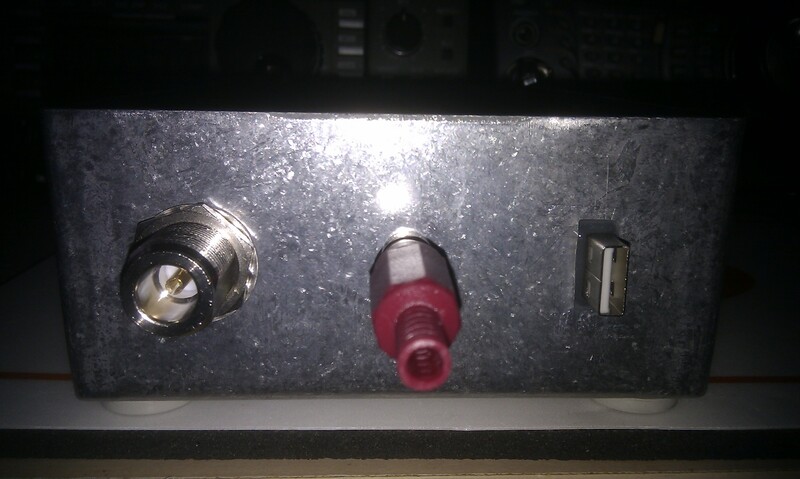 The photo above shows the FUNcube with a SMA to N-socket connection and USB lead with several turns wrapped around a ferrite ring to provide hopefully some protection again noise pickup on the USB connection. 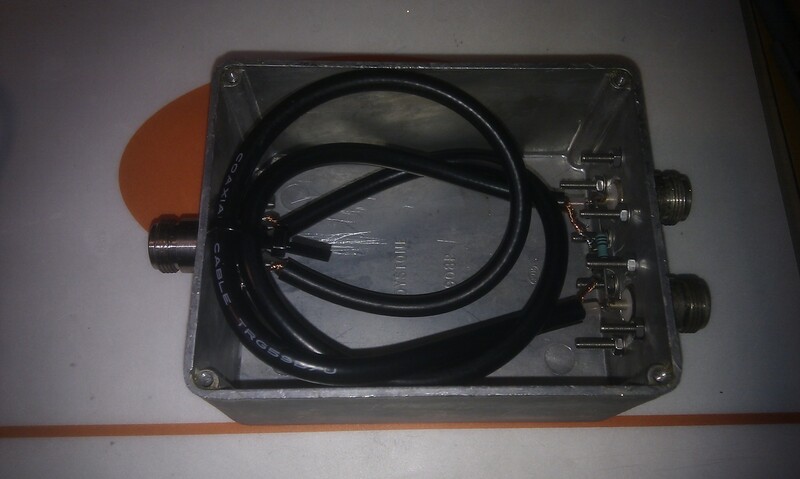 The intention is to incorporate an SMA change over relay inside the box. At the time of photographing the box I was still looking for a suitable relay and implemented a solution using a large high power Radiall N-type relay as shown in the following photo. The final photo shows the aerial (N-type), power and USB connections. 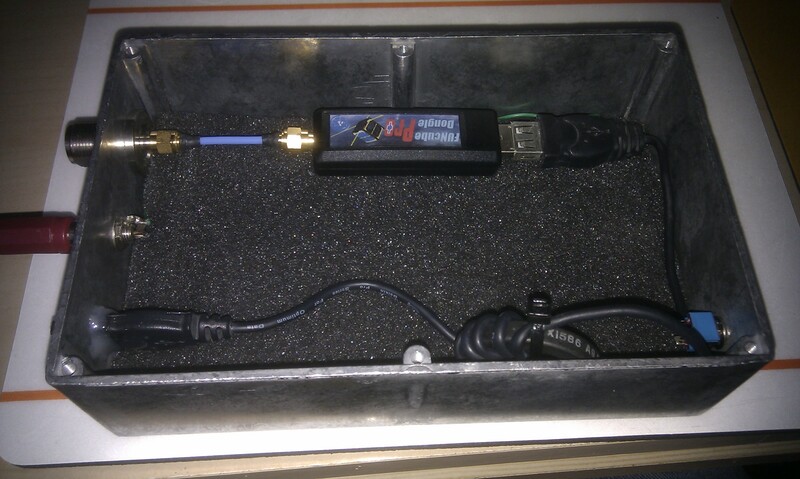 These two new boxes have been incorporated into the station and used extensively on 2M EME and HF. 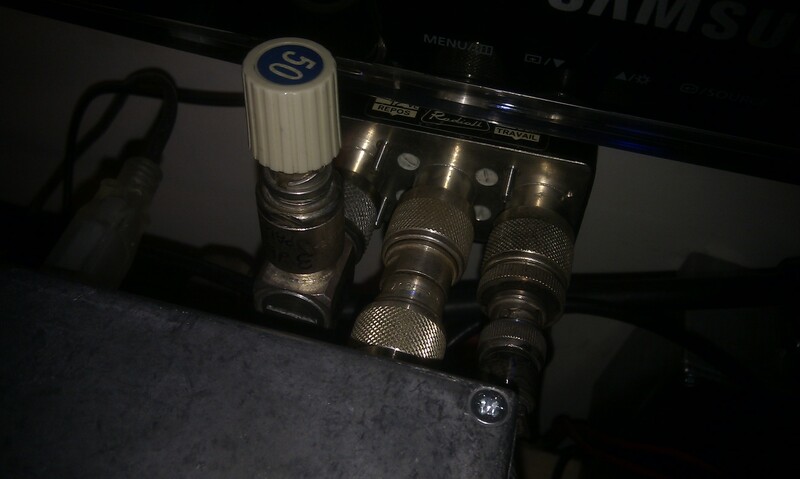 The Radiall relay and 50 ohm termination providing the necessary front-end protection when running full UK-legal power.